Benefits are not based on need, but on your earnings during the base period. The more money you made during your highest quarter, the more your weekly benefit amount will be until you reach the maximum. The base period is defined as the first four of the last five completed calendar quarters immediately preceding the date of your initial claim for unemployment insurance benefits. The best way to determine if you are eligible for Nevada unemployment insurance benefits is to apply with accurate information. There are no penalties to workers who file claims that are ultimately denied. Have a total base period earning of no less than one-and-a-half times your highest earning quarter. For example, if your highest earning quarter was $7,000, your total earnings must exceed $10,500 in order to qualify. You could be eligible for an alternate base period claim if you do not meet the wage requirements in establishing a standard base period for unemployment insurance, using the first four of the last five completed quarters. 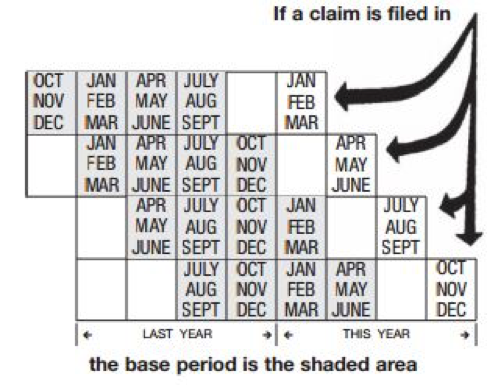 The base period used for an alternative base period is the last four completed quarters at the time the claim is filed. It is essential you meet all other eligibility requirements. Nevada currently offers up to 26 weeks of unemployment. You will lose some of your benefits if you get a part-time job. Each week that you report earnings, your Weekly Benefit Amount will be decreased by 75 percent of the wages you have reported. EXAMPLE: If you are receiving $300 in weekly benefits and earned $100 in a week, 75 percent ($75) of your earnings are subtracted from your weekly benefits ($225). Adding up your wages ($100) with this decreased amount ($225) will still put you ahead ($325). Nevada has no provisions for unemployment extensions in Nevada, even though the state is experiencing a severe unemployment problem. The federal programs, the Emergency Unemployment Compensation and Extended Benefits, which offered extended benefits in times of crisis, were discontinued in 2012.